It's summertime, and for me as a child, summertime meant playing outside from morning until bedtime. There was no TV watching in my house during the day and we didn't have air conditioning in those days. Yes, it was hot outside, but inside was even hotter. So once breakfast was over, my mother would shoo us out the door and along with all of the other neighborhood children, we would plan our day. Activities included hopscotch, rollerskating on the bumpy sidewalk, bike riding, mother-may-I, red rover, paper doll tea parties on a blanket under a tree, hide and go seek (especially fun after dark), tree climbing, playing house in my play house..................and so much more. My father was an amazing carpenter, and he built a wonderful playhouse for my sister and I. We spent many hours in there with our dolls pretending that we were mothers. About 15 years ago we sneaked around to the backyard of our old house to see if the playhouse was still there. There it stood after all those years, a testament to my father's work and the love he put into it. I wish that I had taken a camera with me, because the newest owners have torn it down. It still lives on in my heart and mind, though, with its pretty white paint, green shutters, and sweet window boxes. Did you have a playhouse as a child? I thought I would look around the internet to see if parents are still creating playhouses for their children (other than those plastic prefab things). Here are some wonderful ones. I don't know about you, but I'm feeling like I want to grab my Betsy Wetsy, my tin dishes, and a pitcher of kool aid and head on out the door. Oh yes ! Summers were wonderful when I was a child . I seldom see my grandchildren outside and when they are, they are complaining that it's too hot and they don't have anything to do .I went out in the morning and only came back for meals and bedtime .There was always something to do . Those are so adorable. I want the first one for my potting shed. I didn't have a playhouse but my daughters did. My husband's grandfather had built one on the farm where we lived. The girls had a great time playing in there. But then we had a terrible windstorm that blew it down. When I was growing up we didn't have air conditioning either and I remember playing outside from morning til night. Thanks for bringing back those old memories. I did not have a playhouse as a child :( ! These are just too darn cute. Love them all, but that one with the painted red roof just catches my eye. Cute post! O Laura! You brought a ton of memories back when you said "betsy wetsy, tin dishes". I haven't had that sort of a memory for quite some time. Hey, I didn't have a specific looking playhouse as these, but I made we made our own. When my parents got a new fridge, I got the HUGE box in came in. Man, I played in that thing for weeks at the first of June to the last week of June. I invited friends, neighbors, cousins into that contraption. It was awesome. We had cut flaps on the sides for windows and they could shut by bringing down the flaps that fit snug. We also had furniture in there and curtains on said windows. It was great UNTIL it rained.......... no more play house :( (but I sure have fond memories of it). Thanks for a great picture post of dreamy playhouses! I don't think I am too old for a playhouse like these. I want one. :) The last two are my favorites. I could so go for one of those! Especially the first one or the last 2. They are really something! Boy those are all some fancy play houses. I think I could live in a couple of them! I sure didn't have anything fancy, but I didn't know the difference. I'm with you!! They tore it down????! I loved play houses, even my neighbor's playhouse which was a quonset-type structure that had formerly been a chicken coop, I think. (Yeah, kids were hard up in those days. :-) Anyway, we scrubbed it inside, made curtains, hung pretty pictures on the wall, and dragged our play furniture into it. It was tons of fun! Love each one of them! They're dreamy, magical, looks like they came out of a fairytale! Such amazing playhouses. I suddenly had this intense wish to be a child again! I never had one but I spent the summers together with my sister at our summer house with our grandparents. We had the whole yard and the fields around to play as we like. No TV, no computers thankfully. We had such a fabulous childhood. Picking and eating cherries, or any other fruit... eating peppers stuffed with feta cheese, pretending they were ice cream, playing anything in the shade, in the sun, day in, day out. I wish I had kept more of my childhood imagination! Thank you for this nostalgic post! What beautiful playhouses.! It's sad that yours was torn down especially after having lasted so many years, but at least you have the happy memories of it. Love your play house choices! What a delightful way to spend a summer's day. What fun! I would have loved the pink one. I love that last one. Someone's mom would always provide the Kool Aid for us. I have great memories of summer days as a kid! No, I didn't have one. But I'm glad you did and for all the lucky little ones who have the ones above. and I loved playing house even more. I loved treehouses and storm cellars and barns. I made houses in everything! I too spent my afternoons and evenings outdoors until dinner and yes there was nothing more fun than the playhouse. The perfect place for creative play...gorgeous images!! I bet you did have such fun in your playhouse! I didn't have one, but like you, I spent many hours being momma to my dolls. 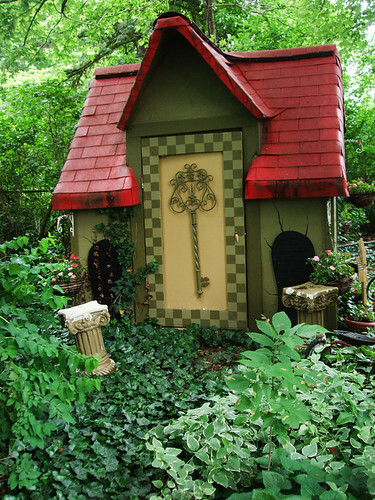 Love your photo collection of today's playhouses. What a cute collections of play houses. I would have loved any one of those for my own. Hummm. I could still love one..but I would save it for some little people I know to use it. Big girl play house. Yum Yum! When I was a kid your imagination made the play house what it was, turning old things in to new creative things. Hmmm pretty much what we do now. Thanks so much for the memories! We, too, were shood out the door with the neighborhood kids. Boy, times have changed...now you have to make play dates to keep your kids busy over the summer....ridiculous! We would go out and play all day, coming back in for lunch, of course...maybe sell some lemonaide on the side of the road then take the sales cash and but some penny candy! Remember penny candy? Candy that really cost a penny! Another thing that just doesn't exist anymore! Then we would come back in the house by 3pm to catch and episode of Tom & Jerry followed by an episode of the original Little Rascals. The playhouses are so cute. I am trying to talk my husband into building these when he retires...haven't had much luck yet.